You'll be £11.99 closer to your next £10.00 credit when you purchase Operation Totalize. What's this? By early August 1944 the Germans fighting in Normandy had been worn down by the battles around Caen, while to the west, the American breakout was finally gaining momentum. Now was the time to launch II Canadian Corps south towards Falaise. With much of the German armour having been stripped away for the Mortain Counter-Attack, hopes ran high that the Corps, reinforced with British tanks, the 51st Highland and the Polish Armoured Divisions, would repeat the success of their predecessors in the Battle of Amiens. An innovative change of tactics to a night armoured assault and the conversion of seventy-two self-propelled guns to armoured personnel carriers for the accompanying infantry was very successful, but up against their implacable foes, 12th Hitlerjugend SS Panzer Division, the pause for bombing allowed Kurt ‘Panzer’ Meyer to deploy his division. Consequently, when the 4th Canadian and Polish Armoured Divisions were launched into their first battle they made frustratingly little progress. As the Canadians advanced over the following days, the battle degenerated into a costly fight for ground as the Hitlerjugend struggled to contain the inexperienced Poles and Canadians. 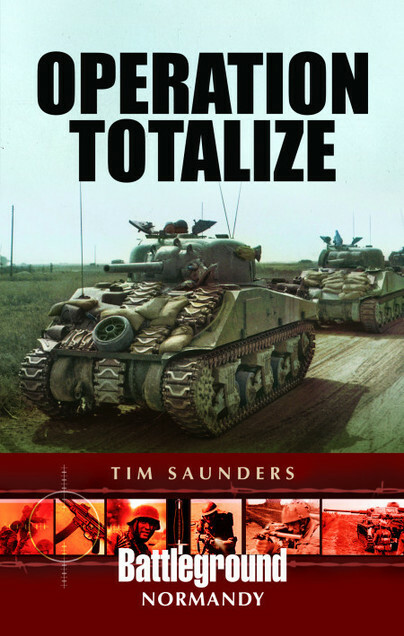 Operation Totalize is renowned for the death of SS panzer Ace Michael Wittmann at the hands of Trooper Joe Ekins and the destruction of Worthington Force, the result of a navigational error.